On Jan. 12, 2015, SpaceX tweeted a photo of the Dragon cargo capsule bolted to the exterior of the International Space Station. This story was updated at 12:30 p.m. EST. 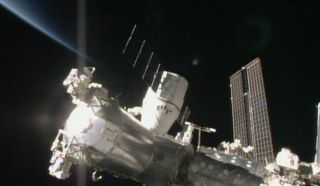 SpaceX's robotic Dragon resupply spacecraft has arrived at the International Space Station after a two-day orbital chase. NASA astronaut Barry "Butch" Wilmore, commander of the station's current Expedition 42, grappled Dragon using the orbiting outpost's huge robotic arm at 5:54 a.m. EST (1054 GMT) on Monday (Jan. 12). The capsule was installed on the Earth-facing port of the station's Harmony module three hours later. SpaceX launched the Dragon capsule early Saturday (Jan. 10) atop a Falcon 9 rocket that lifted off from Florida's Cape Canaveral Air Force Station. After the rocket sent Dragon on its way, SpaceX attempted to bring the Falcon 9's first stage back to Earth for a pinpoint landing on an "autonomous spaceport drone ship" in the Atlantic Ocean, as part of the company's effort to develop reusable-rocket technology. The rocket stage came down on target but hit the drone ship too hard Saturday. SpaceX will try the bold maneuver again on future launches, company representatives said. The cargo capsule also delivered a NASA instrument called CATS (short for Cloud-Aerosol Transport System), which will be affixed to the station's exterior and then use a laser to measure the distribution of clouds, haze, dust and pollution in Earth's atmosphere. Dragon will stay attached to the International Space Station for one month, NASA officials said. It will depart on Feb. 10, returning to Earth with a splashdown in the Pacific Ocean off the coast of California, where SpaceX will retrieve the capsule by boat.